Ever wonder what Kubota recommends for properly maintaining the diesel engine in your Kubota? Purchasers of new Kubota equipment were at one point provided a special DVD that contained an engine maintenance overview hosted by Robert DeNiro Doc Kubota which is Kubota’s official version of our own Service Department Vic. Credit goes to Deen Implement, a Kubota dealer in Texas, for posting the 4 part series that covers lubrication, air intake, cooling and fuel systems. It is hard to recall the last time we saw a diesel mechanic in a nicely pressed button up shirt and tie under his overalls, but try to look past that as you watch the videos. The engine in your Kubota is designed to operate under load, shock cycle, temperature, dust, debris and climate extremes. Think about the engine having to power the tractor and loader as you dig into a pile or summer mowing all the way through to winter snow blowing. Despite these challenges many of Kubota’s engines operate for thousands and thousands of hours (30+ years). Their engines are some of the most compact, powerful for their size and fuel efficient diesels made. Their engine division is something they are most proud of. We have an entire article that details their engine factory in Japan which is also worth a look. Meet Doc Kubota and also see a very rare shot of an L200 around the 1 minute mark. The L200 was Kubota’s first state-side compact tractor which appeared on the scene in 1972 and really was the genesis for the compact tractor market – something that Kubota continues to dominate today. 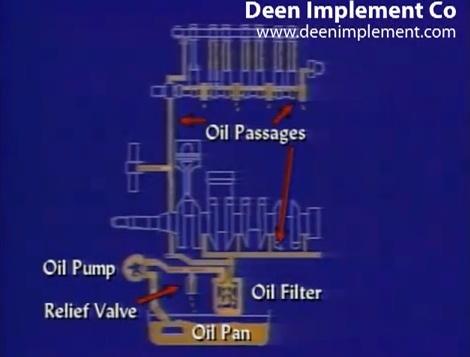 How to select the right oil, oil as a heat sink and when to change the oil and filter after purchasing new equipment (50 hours). We also get a good shot of what oil looks like after 1000 hours and it is not pretty. Air filter overview, safety filters and expected service intervals. Something else interesting here is that Kubota recommends not replacing the filter too often (ie. before the service interval). They claim that the filter performs its best when it is no longer “fresh”. If air filters are replaced at 1/4 of the service interval the risk of engine damage is 300% higher! Follow the guidelines in your operator’s manual carefully. Antifreeze selection, mixing and radiator maintenance. Lots of good tips here: 1) a 50/50 mix of water and antifreeze is better at heat transfer than antifreeze alone, 2) distilled water prevents scale buildup that hurts cooling performance and 3) summertime operation does not require flushing the mix and replacing with water – you get better warm weather cooling performance by sticking with the 50/50 antifreeze-water mix. Fuel types for various climates, including cold weather, fuel line bleeding, filter maintenance and how to prevent water from getting into the fuel. Right around the 3m11s mark we get a nice shot of filters which have been written on as to when they were replaced last. This is something we do in the shop too and recommend this as a best practice. The later half of the video covers some engine diagnostics based on the color and type of the exhaust smoke. We will admit – Doc’s growing on us a bit and even though some parts of the videos sound like common sense there are some good tips buried in there. The bottom line is that you have to take the effort and (small) expense to understand your equipment, its engine and maintain it. Part of that effort is arming yourself with all knowledge available – articles, forums, videos, service manuals, etc. Luckily, if you are reading this on OrangeTractorTalks you are already at one of the best places to start doing exactly that!